What are some story genres and what are they used for ? Read the 3 texts which follow and talk about the things they have in common and the things which make them different from each other. On Saturday we had a netball match in Marrickville. I got up around 8:00 and had some breakfast. Maria and Nicky joined me at the bus stop. They were a bit late but we didn’t have to wait too long. One of the boys in our neighbourhood almost went under the bus taking us to netball. The bus driver was really angry with him. When we got to the field the rest of the team had already arrived. It was a close game, but we won 4-3. Maria got two goals. We stopped at Macdonald’s on the way home to celebrate. Then we went over to Nicky’s to watch videos. A pretty eventful day ! Maria, Nicky and Tatiana were on their way to netball, waiting for the bus. While they were waiting they saw a group of boys on BMX bikes racing along the footpath. The rider in front was being chased by the others who appeared very determined to catch him. As the girls watched, the frightened boy raced towards them. Then just as he drew near the onlookers their bus appeared around the comer. The boy’s pursuers caught up and gave him a shove. The girls watched in horror as the boy on the BMX ran over the curb straight into the side of the bus! As fast as they had appeared the ones chasing the boy took off. The three girls were shocked: they were sure the boy on the bike had been killed. Tatiana raced to the side of the bus and to her great relief saw that the boy was sitting up and rubbing his head as if he was in a daze. Standing over him was the bus driver talking loudly about the importance of helmets. She felt sorry for him. As if almost having a fatal accident wasn’t awful enough he then had to endure a lecture on road safety from a frightened bus driver on top of that. A young boy escaped fatal injury when a bus driver swerved to avoid a victim of a BMX bikie gang chase at Leichardt yesterday. The youth, aged 10, narrowly escaped death as he careered into an oncoming bus attempting to escape from a gang of other youths on bikes. The boy’s bike was damaged but the boy emerged unharmed, except for minor head injuries. He is at present recovering at home with his family. Following the incident, the bus driver, Neil Simpson (39 of Annandale), reported the accident to the police at Leichhardt following an angry interchange with the other members of the BMX gang whom he later pursued in his bus. None of the gang were wearing safety helmets and all were travelling at a dangerous speed on a major public thoroughfare. Note: The notation A means ‘is followed by’; brackets means ‘the stage is optional’; n means ‘the stage can be repeated any number of times’. This text is a very successful example of narrative for a Year 5 writer. 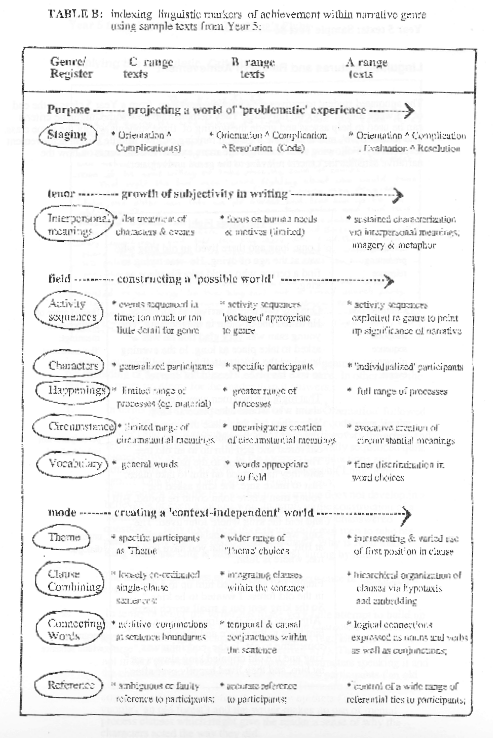 In terms of the genre the writer has exploited all the relevant stages of the genre including that of ‘Evaluation’ (e.g. ‘Now this boy had a problem … ‘). 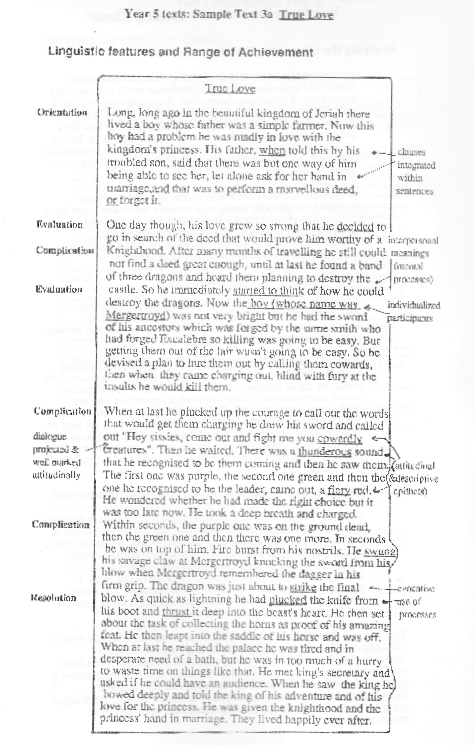 The writer also uses of interpretative comments to focus on the motives and needs of the characters – especially the main character Mergertroyd (‘One day though his love grew so strong that he decided to…’). Also in terms of the ‘Resolution’ stage of the narrative, the writer has constructed a far more satisfying conclusion to the hero’s problems. It is Mergertroyd who is responsible for the deed that wins him his goal (the Princess). Also the writer is obviously comfortable enough with the genre to be able to ‘spoof it in some amusing ways; for example we learn that ‘Mergertroyd was not very bright’, that he is basically cowardly but inventive in his baiting of the dragons, that he does not worry about taking a much needed bath etc. With regard to the tenor, the dialogue is well framed, set off from the event sequence and well marked attitudinally (though infrequently used). Furthermore it is in the planning of the deed that the interpersonal meanings are most fully established. Note the use of mental process clauses like: ‘He decided to go..’, ‘he started to think of how he could destroy the dragons’, ‘he devised a plan’ and ‘he wondered whether he had made the right decision’ etc. The events become significant for the reader because they are framed in terms of the needs and motives of a character. The writer has exploited the possibilities of descriptive epithets in building up the possible world; for example in nominal groups like ‘a simple farmer’, ‘cowardly creatures’, ‘thunderous sound’, his savage claw’ etc. Mergertroyd has a problem of his love for the Princess. His father, the King presents a solution. Mergertroyd’s love grows too strong to bear. He sets out to perform a deed to win the Princess. He has trouble finding a deed worthy enough. He hears three dragons planning to destroy the castle. He devises a plan to trap them etc. “He plucked the knife and thrust it deep”. The circumstantial meanings are also dealt with in an evocative way helping to build up the atmosphere of the tale: ‘the sword of his ancestors’, ‘by the same smith II who had forged Excalebre II’, ‘out of the lair‘, ‘As quick as lightning‘ etc. – Mergertroyd – he etc. This text is in the top range of achievement for narratives in the Year 5 class. Along the dimensions of genre, tenor, field and mode it is a superior achievement for a Year 5 writer. Macken, Mary, Mary Kalantzis, Gunther Kress, Jim Martin, Bill Cope, and Joan Rothery. 1990. A Genre-Based Approach to Teaching Writing, Years 3-6, Book 3. 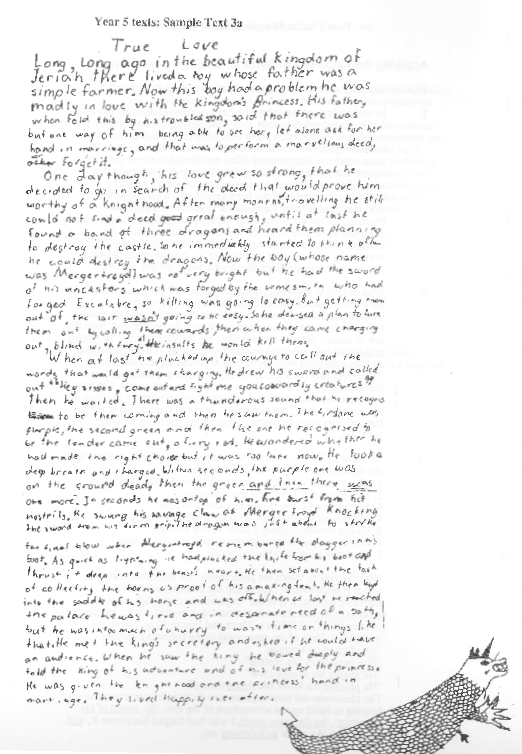 Writing Stories: A Teaching Unit Based on Narratives About Fairy Tales. Sydney: Directorate of Studies, N.S.W. Department of Education, pp.19, 18, 85, 93, 92, 94-95.